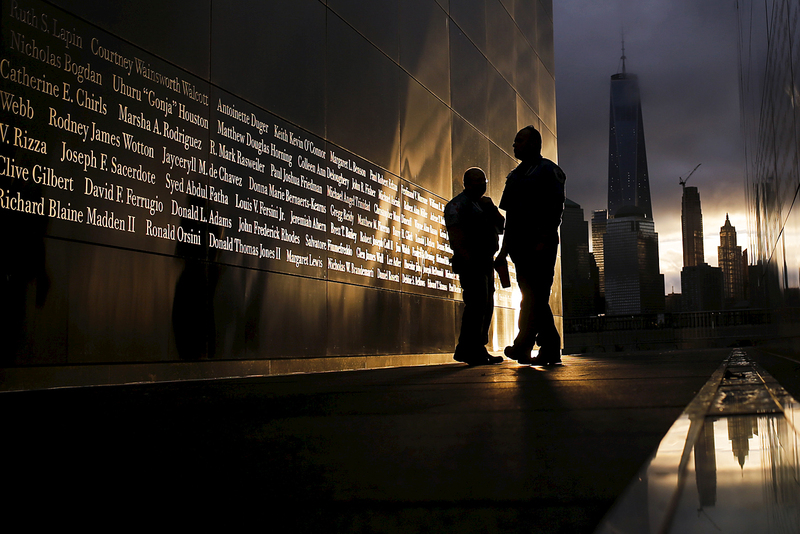 People read the victims' names of the 9/11 Empty Sky memorial at sunrise across from New York's Lower Manhattan and One World Trade Center, in Liberty State Park in Jersey City, New Jersey, September 11, 2015. It is exactly 15 years since the terrorist attack on New York’s World Trade Center destroyed the certainties of the old world in a flash and ushered in a new era of instability and conflict. Almost 3,000 people perished in the tragedy, including around 100 Russian speakers. Here some of those of Russian origin who witnessed the events of Sept. 11, 2001 talk about their experiences on that fateful day. Fifteen years ago on Sept. 11 the U.S. experienced the bloodiest terrorist attack in its history when al-Qaida terrorists destroyed the World Trade Center in New York and significantly damaged the Pentagon building in Washington, D.C. As a result almost 3,000 people lost their lives. Information about how many Russian and other post-Soviet nationals died in the Sept. 11 terrorist attacks varies. The names of 18 victims are immortalized on a monument in Asser Levy Park in Brooklyn, but other sources say there were more victims. According to Valery Savinkin, founder of the September 11 Family Group, about 100 Russian speakers perished in the terrorist act. Valery Savinkin himself, an immigrant from Odessa, lost his 21-year-old son on Sept. 11. "I simply saw everything with my own eyes, not on television," Savinkin told the Russian 5 Channel TV station in 2015 (he saw the fire and the collapse of the towers from the window of a neighboring building). "How first the south tower fell, then the north tower." The Savinkin family have preserved their son's room the way it was on Sept. 11, 2001. Each time they travel they bring their son a souvenir and place it on his desk. As soon as Gulnar Samoilova, a native of Ufa (725 miles east of Moscow) and a photo editor at Associated Press in New York, found out about the terrorist act, she grabbed her camera and rushed to where the crowd was running from: the World Trade Center. Samoilova photographed the first tower collapsing and then the wave of wreckage and dust filling the surroundings. She fell. "There was nothing but darkness. I began suffocating, thinking that I had been buried alive," RIA Novosti quoted the photographer as saying. But it turned out that she was not hurt and she continued photographing. Samoilova was shooting with color film but the photos came out black and white: Due to the cement dust, the entire island of Manhattan became dichromatic. The following day Samoilova's photographs, which showed frightened people running about town looking for their loved ones, appeared in all the international mass media sources. But for her the stress that she had gone through was too strong: After 9/11 she abandoned news journalism. That day she did not take photos of the deceased and those who jumped out of the burning Twin Towers. "I just couldn't do it," said Samoilova. News of the terrorist act reached businessman Grigory Vishnyakov only when he arrived in Manhattan from New Jersey, where he lived. In an interview with the Social Control publication he speaks about the panic reigning in the city. "Some idiots were sending messages that other buildings in the city were mined. It was a canard." The businessman remembers that on Sept. 11 two of his friends accidently did not show up at the World Trade Center, where they worked. "One friend had an office in one of the twin towers. The evening before he drank too much at the Russian Samovar restaurant and woke up at one in the afternoon. He was horrified by the fact that he had missed half a day of work. But when he found out what had happened to the towers, he realized he had been reborn." Another friend of Vishnyakov's, a man named Vinogradov, had been driving to work and was stopped by a policeman for speeding. A few weeks later in court he thanked the policeman, who had basically saved his life. In September 2001 journalist Veronika Kutsyllo, who was working at the Kommersant newspaper, came to New York on vacation with her mother. Like many Americans and tourists she watched the terrorist attack from the roof of a skyscraper in lower Manhattan, where she was staying. "When we watched the burning twins and saw the first tower falling the American 'Oh, my God!' and my mother's 'O, Gospodi!' (Oh, Lord!) sounded exactly the same," Kutsyllo wrote in the newspaper. She was amazed by the feeling of unity that took hold of New York after 9/11, both the residents and the guests. "You cannot experience something like this together with the American people and not understand that they are exactly like us," she wrote. "Almost immediately afterwards [after everyone found out about the terrorist acts – RBTH] our friends came over to our place and we all started speaking just like in a Moscow kitchen," Alexei Pimenov, who in 2001 was teaching Russian history at George Mason University, told Voice of America. Pimenov said that his and his friends' first reaction was one of confusion: "What will happen now? War? With whom? And how will it change everything around us? The pain came afterwards." For Pimenov, the historical meaning of the tragic event was and is still unclear.